The Ergofix is an evolution of our existing models of ergonomic grips and FIXSET InterGrip. We have received requests for a smaller handle, which would provide as much support, but less specific than existing grips. So we reduced the "wing" of support and brought more profiled handles. The part inside of your hand between the index finger and thumb, was reduced conically, in order to adapt to smaller hands, without compromising the holding of the bigger hands. The body of the handle is made of Kraton, to ensure structural integrity, with gel inserts for comfort and grip. On the outer part, we placed a ledge in return for more control. In terms of holding, we have included lock-on rings for easy mounting and prevent them from slipping. The plugs are integrated to the design of the handle, in order to limit the number of small parts. Features: Imitation leather handles with ergonomic seams. Anatomical shape and support hands for comfort. Easy assembly. Butterfly Pattern Length: 132mm. 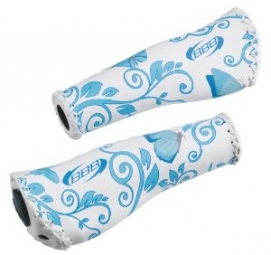 BBB Poignée ''ERGOFIX'' 132mm Bleu + couture is rated 5.0 out of 5 by 2.